Faculty member Michael Mailer, producer of more than twenty feature films, recently returned from the Cannes Film Festival where his film Seduced and Abandoned premiered. “It was an exciting time walking the red carpet,” Mailer said. 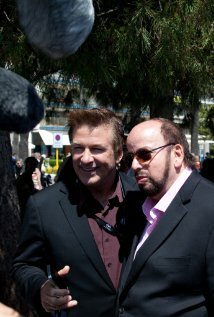 The film stars Alec Baldwin and James Toback. “Seduced and Abandoned is a nonfiction film, part mediation on film and the filmmaking process consisting of interviews of film legends such as Polanski, Bertolucci, Scorcese, Copola, and part adventure tale following the ups and downs of Alec Baldwin and James Toback as they attempt to set up a remake of Last Tango in Paris (but this one is set in Iraq called Last Tango in Tikrit) at the Cannes Film Festival,” Mailer said. HBO bought the film for US distribution and will be airing it this fall, on Oct 25. Mailer is currently working on a new picture in Louisiana. Faculty member Michael Mailer has produced more than twenty features and leads Michael Mailer Films. He has been busy with a new project, starring Alec Baldwin and James Toback, and we were pleased to find out more about this unique production. Q. Can you tell us about Seduced and Abandoned? A. Seduced and Abandoned is a non-fiction film, part mediation on film and the filmmaking process consisting of interviews of film legends such as Polanski, Bertolucci, Scorcese, Copola, and part adventure tale following the ups and downs of Alec Baldwin and James Toback as they attempt to set up a remake of Last Tango in Paris (but this one is set in Iraq called Last Tango in Tikrit) at the Cannes Film Festival. Q. What was the reaction to the process while filming at Cannes? A. Shooting a film about the making of a film at a filmmakers festival was highly stimulating both for all of those involved but for the denizens of Cannes as well. We had great support from the head of the festival himself, Thierry Fermaux. Q. Would you say the project was a success—either in terms of the project itself or in raising money for the ‘undisclosed future film’? A. So far yes. The film we shot turned out well. It’s compelling and will be of interest to anyone interested in film and the filmmaking process. Q. When and where can audiences see the film? A. We’re in post production. The movie will be finished at the end of January, then hopefully viewable in theaters initially, followed by VOD, and other ancillaries.